Did you know Park's Renault offer a while you wait tyre service? Whether a small business or a household, we can minimise the time your vehicle is off the road and the time you spend shopping around by offering expert tyre advice and highly competitive fully fitted price including tyre, balancing, valve, VAT and disposal of the old tyre. Tyres play an important role in accident avoidance, and improving fuel economy. It’s estimated that a third of cars and vans in the UK have under-inflated tyres. If you have a concern about your tyres - perhaps you’ve recently hit a pot hole, struck a curb or road debris, resulting in vibrations from your steering, your car or van is pulling to one side or you just can’t remember the last time you had your tyres and wheel alignment checked -Book in for a free tyre health check with Park's Renault. We also carry our tyre puncture repairs where possible and can fit winter tyres too. It could just be your tyre pressure needs adjusting – we’re on hand for all your car and van tyre needs. Park's Renault offer a full range of budget, intermediate and premium brands including, Motrio (Renaults own budget brand) Falcon, Kleber, Nexon, Bridgestone, Pirelli, Continental, and Michelin and we can easily order any other brand to match your existing tyres. We have new tyres available from £39 and we will always provide you with the information you need to choose the right tyre to match your driving needs. Most drivers become aware of their tyre health through the MOT, which compares tread depth on your tyres against the legal minimum tread of 1.6mm. The law states: The grooves of the tread pattern shall be of a depth of at least 1.6 mm throughout a continuous band comprising the central 75% of the breadth of tread and round the entire outer circumference of the tyre. A new tyre will have 8mm of tread depth, but the last 1.6mm is not usable as it is below the legal limit. So a new tyre has 6.4mm of usable tread. By the time tyre tread measures 3.0mm (1.6mm is unusable within the law) – that tyre is 78% worn, and is very close to the legal minimum tread. The current penalty for illegal tyre tread depth is: a maximum fine of £2,500, with discretionary disqualification and a compulsory driving licence endorsement of 3 penalty points – per illegal tyre. 3mm or Less? Time to Change! Most people would not discard the last 25% of anything, so why at 3mm or below would we recommend replacing your tyre when the legal minimum is 1.6mm? The answer is simple – while the last squirt of the tomato sauce from the bottle might be as good as the first - for tyres it’s a very different story. A tyre with 3mm of tread performs considerably worse than a tyre with 8mm of tread, and performance degrades rapidly as tread depth decreases toward the legal limit. A tyre with 1.6mm could easily be travelling at 30mph when the 3mm tyre has stopped – which might me 100 foot after a car with a new tyre has stopped. Should I choose Budget or Premium? Who isn’t looking to save money on tyres? That’s why we offer tyres from £39 in our budget range, but the cheapest tyre is not necessarily right for everyone. New tyre legislation means anyone selling you a tyre must provide you with an environmental label –similar to the label you’ll find on fridges, freezers and other white goods. This will show the tyre rating for noise, braking in the wet and fuel consumption to enable you to make an informed choice. 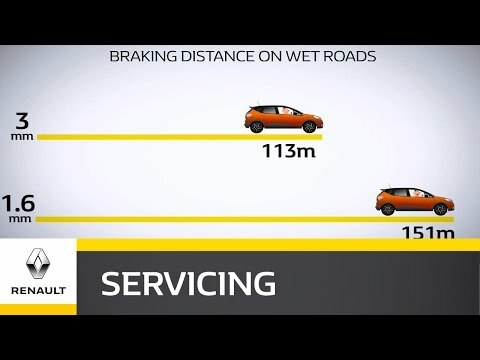 For safety your tyres wet braking distance is key. Before you opt for the cheapest tyre available, consider the type of driving you do and what that means for the type of tyre you should fit to your car or van. If you mostly drive on motorways consider a premium tyre for improved grip at higher speed braking. If you live in a rural area consider a premium tyre for the best braking performance on wet or slippery roads.